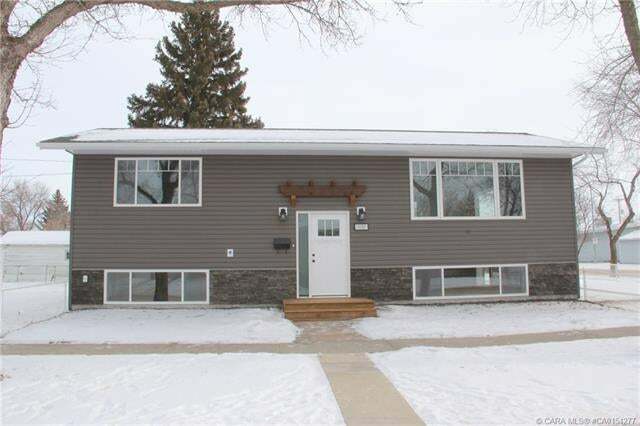 WOW – EXCEPTIONAL HOME - Fully renovated top to bottom & only steps away from Downtown and Schools! Don’t miss out on this beautiful property on a huge 85’ x 130’ lot, oversized 24’ x 28’ double garage and RV parking. As you drive up you will notice the home has been fully updated with new windows, vinyl siding, terrific stonework, shingles plus soffits and fascia. When entering the home you will appreciate the bright open floor plan, along with the freshly installed vinyl plank flooring. Gorgeous new kitchen with white cabinets, large Centre Island, subway tile backsplash and lovely countertops. Nice size dining room for family gatherings, great living room, wonderful master, spare bedroom and new 4 pc bathroom. The fully developed basement offers 2 bedrooms, family room, laundry room and 4 pc bathroom. Everywhere you turn you will notice this home has been updated including the kitchen, bathrooms, bedrooms, flooring, light fixtures, paint, windows, furnace, garage floor & much more!